WBEN’s Tom Puckett had me over a barrel last Friday when he asked Stilltalkintv to predict what the national audience will be for Nik Wallenda’s high-wire walk over Niagara Falls this Friday. I felt a little like ESPN’s outspoken analyst Stephen A. Smith when asked who was going to win game 7 of the Eastern Conference finals between the Miami Heat (who won) and the Boston Celtics. Smith said four words that rarely come out of his mouth: “I have no idea.” Or something like that. I have no idea how many people will watch nationally or locally. I can’t find anyone in my social circle who is all that interested in watching the daredevil but I learned long ago that my interests and that of my friends can be very different from those of the public at large. I imagine if a Western New Yorker is home Friday night, he or she will be watching on one of the channels carrying it. Local TV is doing its booster-ism part. I thought Channel 7 would be the only station to carry the walk live locally because of its affiliation with Channel 7, but since have heard promotional plans by Channel 4 and Channel 2 to get in on the act. How it that possible? According to Channel 4 General Manager Chris Musial, ABC’s “exclusive worldwide rights” mean it only has the national rights to the walk. Musial has been told by the Parks Commission he can carry the walk live on WNLO-TV’s 10 o’clock news. He added he probably will simulcast it on Channel 4 at 11 p.m. if it is still going on. Channel 2 has said on air that it plans to stream the walk live on WGRZ.com as well. Channel 2 also plans to carry it live on its 10 p.m. newscast on WNYO-TV. Maybe it will even make No. 1 on the newscast’s silly countdown. Nationally, I’m not so sure what to expect. ABC isn’t taking a Wallenda-sized risk. The program airs on Friday night, which is where network TV generally sends programs to die. It is one of the lowest viewing nights of the week, along with Saturday. So the Wallenda Walk should dominate nationally as long as viewers aren’t bothered by the long wait before the walk starts after 10 p.m. There has been some local criticism of ABC forcing Wallenda to be tethered, which substantially reduces his – and the network’s — risk. I can’t see how ABC could have done anything else. There is an old joke about the lengths that TV will go to get an audience. The joke goes that networks will eventually air live executions to get an audience – and that Fox will eventually air live naked executions. ABC smartly didn’t want to risk coming close to achieving that level of exploitation if disaster struck. It should be applauded, rather than condemned for the safety measure. The big question is whether the sentence in ABC’s release about the promotional and tourism benefits for Niagara Falls will become a reality. I have no idea. I will say that “The Office” gave the Falls quite a promotional boost a few seasons ago when the heavily-watched episode in which Jim and Pam got married in the Falls aired. I’m not aware of any significant boost in tourism after that. Understandably, the local media is heavily invested in the Wallenda Walk. The local TV stations are walking all over themselves in promoting it. And The Buffalo News carried a front-page story about it Sunday and five more pages of stories in the Spotlight section. 6 responses to "Walking Through TV Plans for Wallenda Stunt"
I definately think this thing is being overplayed, I personally could care less. 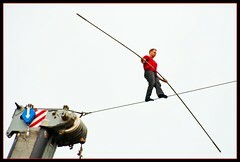 To me, watching Wallenda walk on a wire for a 1/2 hr., wearing a harness,is the equivalent of watching the grass grow. Also, what’s with the the dramatic music played before any reports on the walk ? If he was not going to wear a harness then I definitely wasn’t going to watch but now that I hear he is I most likely will watch. I am thinking that he will have a big crowd to watch and it should also do well with the television viewing audience. Enquiring minds want to know: what if he has to sneeze,cough,has an itch that needs to be scratched ,gets a cramp in “any” of his muscles half way through,is attacked by killer seagulls???? Just some what ifs from my feeble mind. There’s also another factor in regard to why the other networks are allowed. Just like the Macy’s Thanksgiving Day Parade or Times Square’s ball drop, you really can’t sell rights to events that happen in public. You can, however, sell “official broadcaster” endorsements (as Macy’s and Times Square have done with NBC and ABC respectively).